‘The Great British Bake-Off’ Season Numbers in the U.S.
Three years ago, PBS brightened the sad, monotonous landscape of American food TV by importing The Great British Bake Off from the United Kingdom, and began broadcasting it as The Great British Baking Show. It was the same charmingly simple show, but with a slightly different title, because Pillsbury owns the trademark on the phrase “Bake-Off.” No problem, right? Americans and Brits are used to seeing the same entertainment repackaged with slightly different names: Prefab Sprout’s jangle-pop masterpiece “Steve McQueen” was called “Two Wheels Good” when it debuted Stateside. The Teenage Mutant Ninja Turtles are the Teenage Mutant Hero Turtles in the U.K. And, perhaps most famously, Harry Potter and the Philosopher’s Stone became Harry Potter and the Sorcerer’s Stone in the United States, presumably so Americans wouldn’t think the book was about boring philosophers. But the slight difference in titles does not explain the blender-with-its-top-off mess that is the organization of the show’s seasons in the U.S. If, say, you were looking for the fifth season of the show, you might find The Great British Bake Off series five on BBC One, or The Great British Baking Show season five on PBS, or The Great British Baking Show collection five on Netflix. Alas: Each of these is an entirely different season of the show. Earlier this year, I felt forced to create this Great British Baking Show season chart just to keep it straight, but somehow that still isn’t quite enough. How did we Americans — who just want to watch some wholesome Brits bake lovely scones in a gently competitive environment — get stuck with such insanity? Let’s unpack. 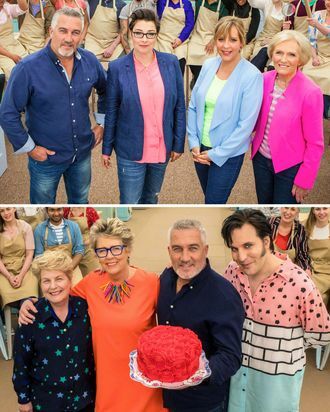 PBS began its stateside broadcasts with U.K. series five, and since that was the first real taste of the original Bake Off in the colonies, PBS called it season one. Now, it probably would not have been too confusing for PBS to call it season five, but they stuck with one, and compounded the confusion by airing the U.K. seasons out of order, going backwards and then forwards. So, PBS changed the show’s name and the season numbers. If that’s where it had ended, such modifications would have been tolerable, especially because PBS had earned the gratitude of American viewers who were now able to legally watch the show on public television, or stream it on PBS’ website, or even buy it on DVDs that worked in America. Perhaps Netflix has grand plans to air the first three seasons — no one has yet brought U.K. series one or two to America — and label them as The Beginnings. But why? Why make me search through the clumsy Netflix interface to find an entirely different show? Why not just keep it all together? After all, in its home country, it is one show: every season ordered logically, all produced by Love Productions, all with the same bunting and twinkly music. To make matters worse, the show famously left the BBC two years ago in a messy divorce that ended with the show’s airing on Channel 4, without original cast members Mary Berry, Mel Giedroyc, or Sue Perkins. Now, the latest seasons of the show appear in the U.S. exclusively on Netflix, which of course went and made things even more confusing. The streaming company labeled U.K. series eight — the first Channel 4 version, which kept numbering seasons sequentially — as Netflix collection five. Now that Netflix is the primary home of The Great British Bake Off in the U.S., viewers are forced to figure out whether Netflix’s season numbering maps to the U.K.’s organization, or to PBS’. And none of the Netflix series numbers match the original. Maybe it’s unfair to single out The Great British Bake Off/Baking Show, since series-numbering-and-naming madness is not limited to quaint baking-competition shows. Case in point: ABC has decided to ignore 16 seasons of American Idol on Fox and just start numbering again from one, so next spring’s season will be season two, even though everyone knows “American Idol season 2” is actually the season that gave the world Clay Aiken. But still: How difficult would it be for Netflix to simply re-number and rename its seasons so they’re all in one place, easily found and available for viewing? It certainly seems like that would not be hard at all, but in the meantime, we Americans are stuck with season numbers that are messier than a broken buttercream. To make it easier, Grub Street has put together this handy guide, which anyone can refer to to see exactly how they can find any of the show’s many seasons. Can Food Network Survive in the Age of Netflix Cooking Shows?